Energy stocks have been on a tear lately, pushed along by a resilient oil price and a boom in both natural gas and oil production. The short-term forces driving this rally remain volatile. But the longer-term trend is much clearer, and it’s very bullish for American energy. In a brand-new video report, resource expert Sean Brodrick gives you an insider’s look at a landmark shift taking place in the global energy industry — one that’s already sent investments soaring by over 1,345% in the wake of the financial collapse! This story is so big — and Sean’s recommendations so urgent — that we’re making this online video available to all Weiss subscribers absolutely FREE of charge. Drillers are setting up new operations all over the United States—from the oil fields of North Dakota to the gas-heavy Marcellus shale in Pennsylvania, Ohio’s Utica Shale, and more. Texas is on pace to issue the most drilling permits since 1985 as output from Eagle Ford, the Permian Basin and the Granite Wash surges! Daily U.S. oil production hit a record high last year—6.4 million barrels per day—and is expected to jump another 900,000 barrels per day in 2013, a record for growth in a single year! And it’s not just the U.S. that is pumping more oil and gas—Canadian oil production is also on an unprecedented climb toward 6 million barrels per day by 2020, according to a recent CIBC forecast. That’s up from 3 million a day in 2011, and growing faster than previously expected. The new forecast also expects output from the oil-sands region in Alberta to more than triple from 1.6 million barrels per day in 2011 to 5 million bpd by 2030. Canada’s oil-sands deposits hold the world’s third-largest reserves of crude oil, behind Saudi Arabia and Venezuela. Looking down the road to 2020, we can expect that nearly half of the crude oil America consumes will be produced at home. And 82% will come from this side of the Atlantic, according to the U.S. Energy Information Administration. Meanwhile, analysts at Citigroup say U.S. crude oil and natural-gas liquids output has the potential to nearly double, to 27 billion bpd by 2020 from 15.4 billion bpd in 2011. For the past year, the amount of natural gas in storage has hovered between an enormous 2,500 billion and 3,000 billion cubic feet. This is due in part to all the new technology that has opened up previously unreachable deposits. And likewise with oil. There, our production is increasing, but our consumption is actually declining thanks to higher-efficiency vehicles and changing demographics. For example—with natural gas flooding the market and scraping 10-year price lows—many of the larger-scale and less-specialized gas companies are taking rigs offline … leaving the resources in the ground and waiting for the price to rebound. But why wait for higher prices? As you can see, America’s New Fuel Revolution is already under way, and I know from personal experience that it’s cranking out some of the most-staggering gains we’ve seen in a lifetime. Just click here to find out more and get your chance to collect a $1,395 gift! 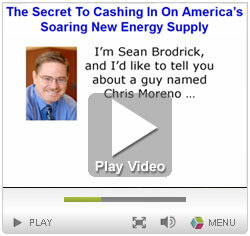 This video covers absolutely everything you’ll need to know about the power-packed New Fuel Revolution investments that have already soared by up to 1,345% in the wake of the financial crisis … and how you can use them to tap into America’s explosive new energy boom for massive profits! Details on three red-hot stocks to play this fast-moving trend for profits of 56%, 131%, even as much as 280%! Just turn up your speakers and click here to take a look. But hurry; the deadline to collect your gift is just three days away! The glut of natural gas has sparked a welcome change for U.S. chemical producers after years of decline. Chemical producers are planning billions of dollars’ worth of plants around the Gulf of Mexico to capitalize on cheaper gas. Fertilizer companies including CF Industries Holdings (CF) are also planning to construct gas-fueled plants. Other companies from around the world that consume gas may be inspired to move their facilities to the U.S. market, including steel and other manufacturers. They would then provide even-more steel consumption and manufacturing capacity. In short, we are talking about nothing less than the re-industrialization of America. … Including the Biggest Potential Winner! You want to know who the biggest winner of the New Fuel Revolution could be? A recent report from research firm IHS Global Insight shows that America’s new energy boom has created 1.7 million new jobs. And that could rise to 3 million new jobs by 2020, while adding billions of dollars to federal and state revenues. Over the past few days, we’ve talked about several ways to turbo-charge your portfolio with energy plays … from adding master-limited partnerships to potentially double your yields … to exploring a lucrative subsector that can pay off potentially bigger and faster than by playing the broader energy space alone. The strategies we’ve covered together should do very well as the next chapter of America’s energy revolution unfolds. But there are so many ways to play this space for profits that I can’t cover them all in this space. However, one final area to consider today is an oil-services ETF. Examples would include the iShares Dow Jones U.S. Oil Equipment Index (IEZ), Market Vectors Oil Services ETF (OIH), PowerShares Dynamic Oil & Gas Services ETF (PXJ) and SPDR S&P Oil & Gas Equipment & Services ETF (XES). All of these have enjoyed good runs, but as oil and nat-gas production increase, they could see fatter profits and higher prices ahead. Can you make a lot of money on America’s new energy boom? Yes you can. And the biggest gains may not be on the companies pumping oil and gas out of the ground. The beauty of it is most investors haven’t caught on to that fact yet. That means you have a profit opportunity just waiting for you to grab it. But if you’re doing this on your own, do your own due diligence and be very careful.